(Newser) – A very strong earthquake rattled the Northern California coast and was widely felt across the region, but authorities said early today that there were no reports of any injuries or damages. 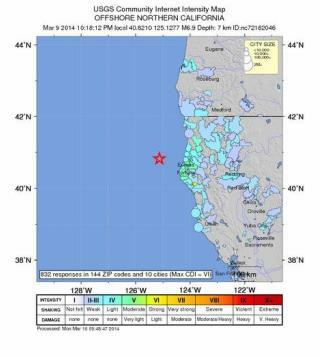 The magnitude 6.9 quake struck at 10:18pm PDT Sunday and was centered 50 miles west of Eureka and about four miles beneath the Pacific seabed, according to the US Geological Survey. It was followed by about a half-dozen aftershocks, including one of magnitude 4.6. Got a bottle of Moët & Chandon champagne for the 'big one' . Didn't feel a thing, go back to bed. A "big one" could hit Southern CA at any time. With that in mind, this writer has a comment that applies to all of us, especially those having breakfast in Southern CA this morning: "God gives us life and we often forget to say thanks."